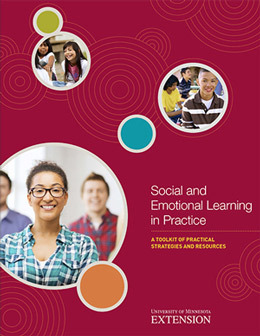 For several years now, our center has been digging into social and emotional learning (SEL). We've studied it, hosted a series of public symposia about it, and developed trainings to support it. Now I am delighted to announce a free online resource to help practitioners bolster SEL into their programs. This toolkit is a flexible set of practical tools, templates and activities that can be used with staff and youth to increase intentional practices that support social and emotional learning. Use data for improvement: Collect SEL data for improvement by creating a data dashboard by using reflective activities to measure change over time, having youth assess and provide feedback to the adults that support them in learning social and emotional skills, and a checklist to help select SEL outcome measurement tools. The toolkit was designed as a companion to our 3-hour training, Social and Emotional Learning in Practice, which recognizes that while there are no cookie cutter methods that work with every young person, youth workers can influence how social and emotional skills are caught and taught within their program. Because while we emphasize that you don’t need an SEL curriculum, we also saw a need for practical tools, templates and activities to help youth workers intentionally infuse their programs with strategies that support social and emotional learning. The goal is to work smarter not harder. You’ll find activities designed to fit in a single session and can be integrated into existing program plans. Each activity indicates the intended audience, time recommendations, required materials, and instructions for the facilitator. Use the activities in any order and modify them to meet your needs. The templates are ready to use resources that can be tailored for your program context. Each template includes an editable PDF and suggestions for use. And there are other tools like questionnaires, guides, or other resources that can be easily used to spark a conversation or gather feedback. Each tool includes background information and suggestions for discussion. The toolkit offers suggestions for how to extend each activity, so that it can be customized based on the youth worker's knowledge of what works well for their group. I also love that the activities are rooted in practice with youth, that they would work in real youth work situations, not just on a theoretical level. It is easy to "grab and go" and visually appealing. It is helpful that the exercises and activities are designed to be flexible and adapted to a particular program, rather than having to independently adapt or select from a full curriculum when it wasn't designed that way. We hope you find this resource useful, and we welcome your feedback! Congrats team for putting together the SEL Toolkit. Looks terrific and I am sure it will get a lot of use. Hope many people make use of it and the trainings you've created. Solid research and resources. Thank you Kate, Margo and Brandi. Congratulations!